Yes, that's me sneaking up on the tail of a nearly 4.5 m Nile crocodile (Crocodylus niloticus) in the Okavango Delta recently [photo credit Brad Bestelink, Natural History Film Unit]. We called this crocodile "Number 9" because that's his data ID. It also has a nice ring to it. If you want to see what happens next, you'll have to tune into 60 Minutes (Australia) which airs this Sunday 15 July at 8pm (EST) on Channel Nine. This is part of a research project that we're running in Botswana, the details of which I'll go into in a future post. 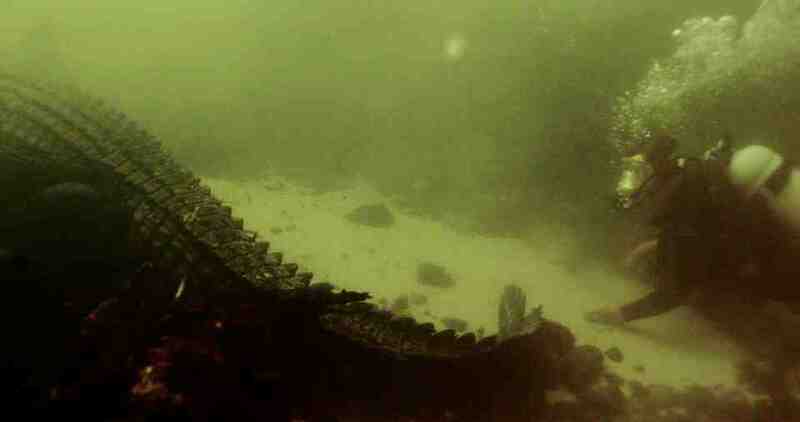 There is a reason behind getting so close to this crocodile underwater, other than simply getting some amazing film footage courtesy of the Natural History Film Unit. Here's the 60 Minutes promo for the story. They dusted off Mr Dramatic Voice-over Man just for the occasion. Yes I know, it's a promo, it has to look like a Michael Bay movie, but I'm fairly sure the actual story itself will be more balanced. If not I shall send Smaug across to deal with them. Liz Hayes (reporter) also posted a blog about her experiences with us in Botswana which you can read here, and there's a photo gallery here. Finally, I'm going to be the web guest in the Chat Room after the show at 9pm, so come along and ask some questions. [update] You can see the story online now here. It's a shame they didn't spend more time on the actual research project and why we were diving, but overall I think they did a pretty decent job. Is there any way in which we would be able to see this in the USA? I've updated the post with a link to the video of the story now, there are no restrictions to seeing it online in the US. The US version of 60 Minutes will also be doing their own story which will air later in the year. Very interesting to say the least. Would groundbreaking science be the right word? I think this could start a new phase in croc research as well as tourism. This would also be a good way to search for large crocs.